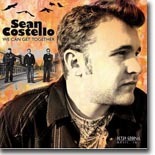 We honor the late Sean Costello, whose latest disc, We Can Get Together, is a fitting tribute to his tragically short career. It's this month's Pick Hit. This month's Surprise features the current CD from a man who was also featured with our very first Surprise pick in December 1996. Clarence Spady's Just Between Us is a keeper. The Kinsey Report put out a fine CD for their late '80s Alligator Records debut, Edge of the City. It's this month's Flashback feature. Our What's New section features new releases from The Mississippi Marvel, Amos Garrett, Duke Robillard, Eric Lindell, Dan Treanor & Jack Hadley, Samuel James, Moreland & Arbuckle, JW-Jones Band, and more, plus concert DVD featuring Billy Gibson.